Garden Sheds - Who Has The Best Garden Sheds? Garden sheds are part of the fabric of the United Kingdom, they’re more than a building they’re a national symbol. Of course, they can be very useful as well. 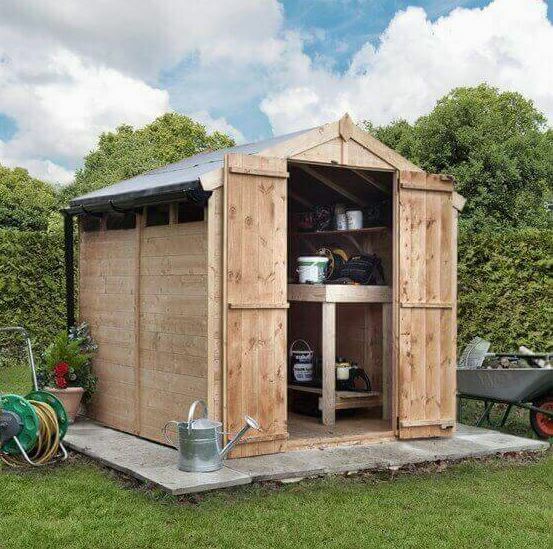 A high quality shed is an essential purchase for any keen gardener, providing a safe and convenient location to store all the tools and equipment needed to keep a garden looking good all year round. They can also provide a great spot to relax in, or to pursue a hobby or craft activity. 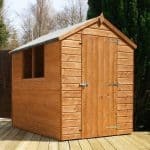 With so many sheds to choose from, WhatShed have created this helpful guide to the very best garden sheds that can be bought online in the UK today. 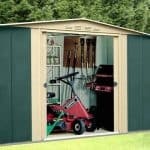 To distinguish a garden shed from workshops and small storage sheds, we have only considered sheds that are at least six foot by four foot in area, and that are a maximum of eight foot by eight foot. We’ve also insisted that our garden sheds must have at least one window, as this allows the owner to look out at their garden and provides the light needed for typical garden shed activities. Other considerations have included price and overall value for money, style and design, and durability. With so many garden sheds to choose from, made from both timber and plastic, selecting the top twenty, and then the top one, was a hard task. 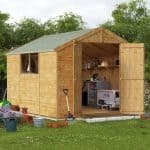 It’s well done, then, to the Shed-Plus Champion Heavy Duty Apex Shed. It earned its place at the very top of our league table of the best garden sheds by providing very good value for money, lots of interior space, and a long 15 year guarantee which shows how effective its initial pressure treatment is. Whether you want garden sheds or larger metal workshops, or anything in between, WhatShed will bring you the independent reviews that can help you make a perfect purchasing every time. 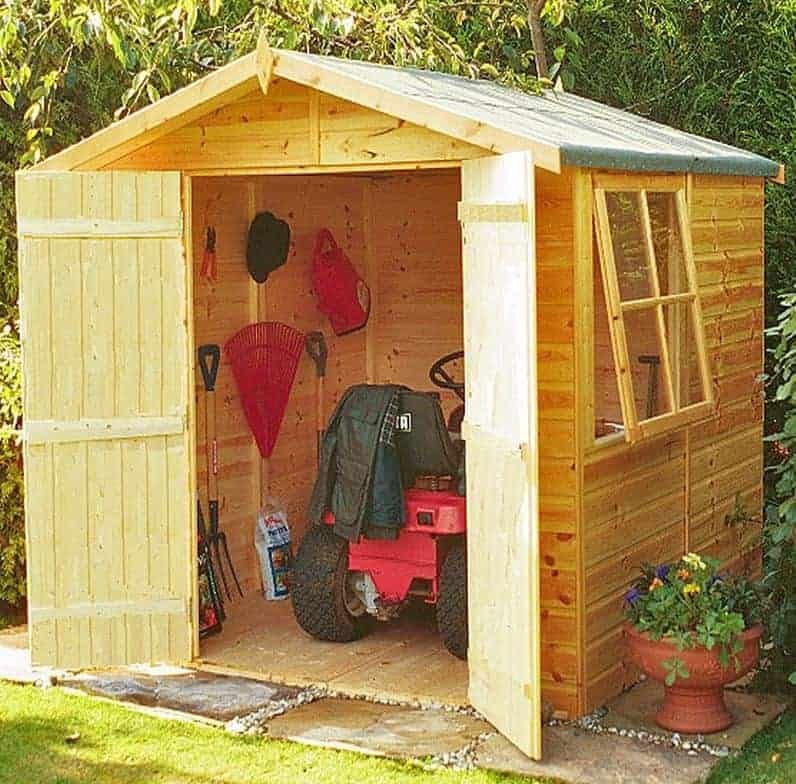 High quality garden sheds can take many forms, but the timber apex shed is a timeless design classic, and this heavy duty shed from Champion is a prime example of just why it’s so effective and so in demand. The apex roof itself is very good at dispersing rain water, and we were pleased to find tongue and groove cladding used throughout, which being tightly interlocking means that there’s no way for water to get into the interior. We were even more pleased that the timbers had also been pressure treated, which gives it a fifteen year warranty against rot. 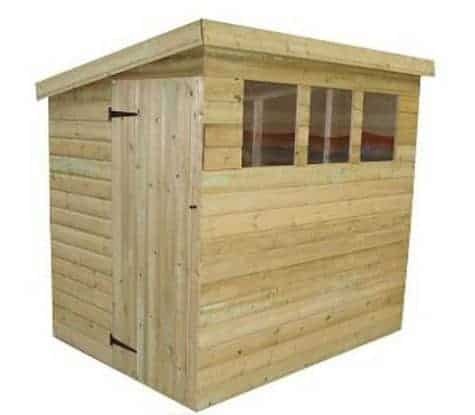 This then is a large shed that has classic good looks, is very strong and very durable, and it is these qualities that carry it to the top of our league table of the very best garden sheds. With a base area of eight foot by six foot, there’s lots of room to move around in inside, and the tall ridge height of 2.21m means that it never feels claustrophobic. There’s also lots of natural light inside, thanks to the inclusion of two opening windows, and we were very pleased to see that they were glazed with toughened glass, which isn’t something that we usually see on the garden sheds we review. 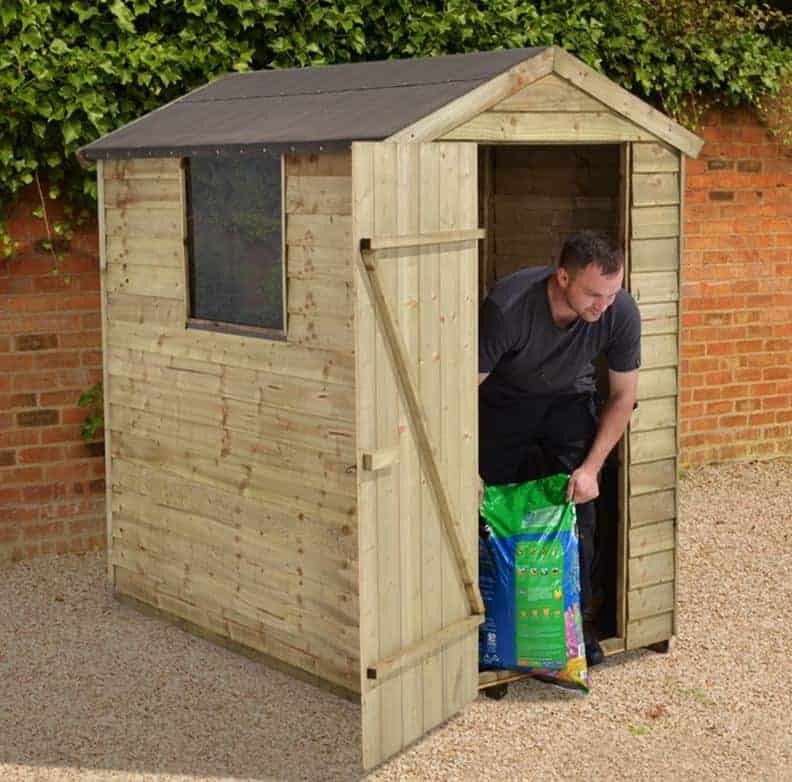 With a key operated lock included as well, we feel that even though this isn’t one of the cheaper garden sheds in our list, it still represents good value for money. The vast majority of garden sheds within our top 20 league table have a timber construction, and yet the runner up spot goes to a shed that’s very different. It’s made of polypropylene, and this brings with it many advantages. It can’t rot or rust, of course, and it’s also immune to the threat of insect attack. Further to this it’s lightweight and easy to install, and it’s virtually maintenance free. We appreciate, however, that not everybody likes the look of garden sheds, and we also feel that the warranty period supplied could have been longer than ten years given how durable the substrate was; these factors are what keeps it off of the top position. The base area of this shed is just over eight foot by just under six foot. It has bold looks that we found very attractive, and we especially liked the arched tops to the double doors. We also appreciated the two square window on the side panels, which are something that we don’t often see on plastic sheds. As there’s also a translucent panel on the apex roof which acts as a skylight, the interior is very well illuminated which is another reason that this is one of our favourite garden sheds, albeit one that may not be to the taste of those who prefer traditional looking garden buildings. We’ve reviewed lots of garden sheds made by Shed-Plus, and we’re invariably impressed by their strength and design quality. The proof of this is that they account for two of the top three positions in our league table, which is a laudable and well deserved achievement. 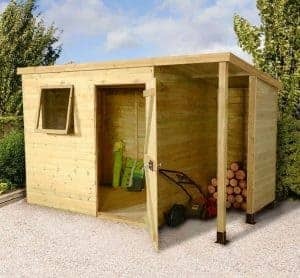 This shed is more compact than its compatriot in the top position, with a base area of six foot by four foot, but that makes it suitable for gardens that don’t have a lot of spare space. 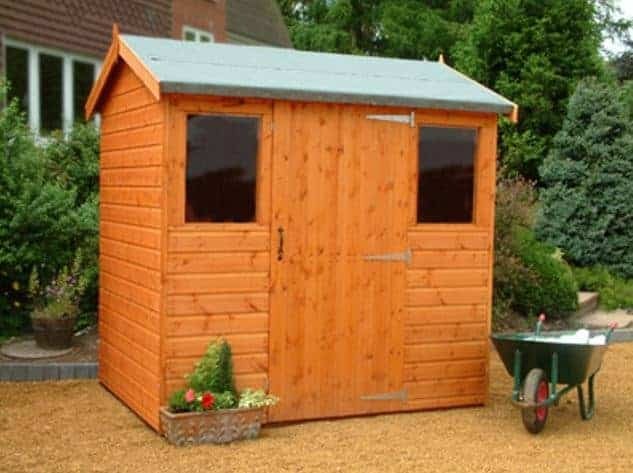 It also makes it more affordable, and the great value price tag of less than four hundred pounds helps this good looking shed achieve such a high position. Added value is given by the initial pressure treatment that has been applied to the tongue and groove cladding. This not only gives it a long lasting protection against rot, exemplified by the 15 year warranty supplied by the manufacturer, it also means that the owner won’t have to spend time and money adding their own coats of wood preserver on an annual basis. The framing was also noticeably thicker than average, so this feels very stable when assembled. We were also pleased to see that the one side window could be opened, making this easier to ventilate and cool down than many of the garden sheds we review. This is the first of the garden sheds in our league table to feature overlap cladding. We do prefer tongue and groove cladding of course, as this is typically thicker and therefore more stable. This difference can be more pronounced however on larger sheds than the eight foot by six foot one featured here. One thing that the overlap cladding does do, however, is make the building as a whole much cheaper to construct and therefore more affordable to buy. It’s this price tag of less than three hundred pounds that really caught our eye, especially as the timber has been pressure treated and is therefore guaranteed to last at least 15 years free of rot, which is why it gains such a lofty position in our list. Even with overlap cladding, it will still feel strong and resilient when assembled, and the cladding is still effective at carrying rainwater away. This is also helped by the apex roof, and we found it noticeable higher than most similar garden sheds we’ve reviewed. What we liked most about the roof, however, is that it’s made of onduline, which is a modern alternative to traditional roofing felt. It’s cost effective and very durable, and a neat touch for such a low cost shed. Not all gardens share the same dimensions, or even the same shape, so it makes sense for garden sheds to come in different shapes as well. That’s just one reason that we liked this well designed and tough shed. It has a reverse apex which means that it’s significantly wider than it is deep, in this case 2.42 and 1.82m respectively. That makes it an ideal choice for people with shallow gardens, and yet there’s still lots of room inside for storage, growing, or activity purposes. It’s also the reason that we found it so eye catching upon first sight, but that’s not the only reason that it earns a place as one of our top five garden sheds. This is one of the toughest garden sheds we’ve seen, thanks not only to the tongue and groove cladding used throughout but also to the thicker than average 34 x 34mm frame. Once again, we were pleased to find that an initial pressure treatment had been used and that this brought with it a 15 year guarantee. This is a value adding feature that we always welcome, and it’s also a sign of quality. There’s a single door and single window alongside it, and with toughened glass inside it you won’t have to worry about it shattering after an accidental impact. This is one of the largest garden sheds in our WhatShed league table, which means that it’s also one of the most flexible buildings on our list. With base dimensions of 2.07 x 2.07m there’s lots of storage space available, or it could even be used as a small scale workshop thanks to the two fixed styrene windows on a side panel. It could also make a comfortable environment to pass a few hours in at the end of a day, and the wide opening double doors make it easy to bring furniture or other large objects in and out. We were pleased to find that although it’s relatively large in size, the asking price wasn’t. The reason that it can be sold at such an affordable price is that it has overlap cladding with solid sheet material used for the apex roof, where it’s then covered by roofing felt, and for the floor. 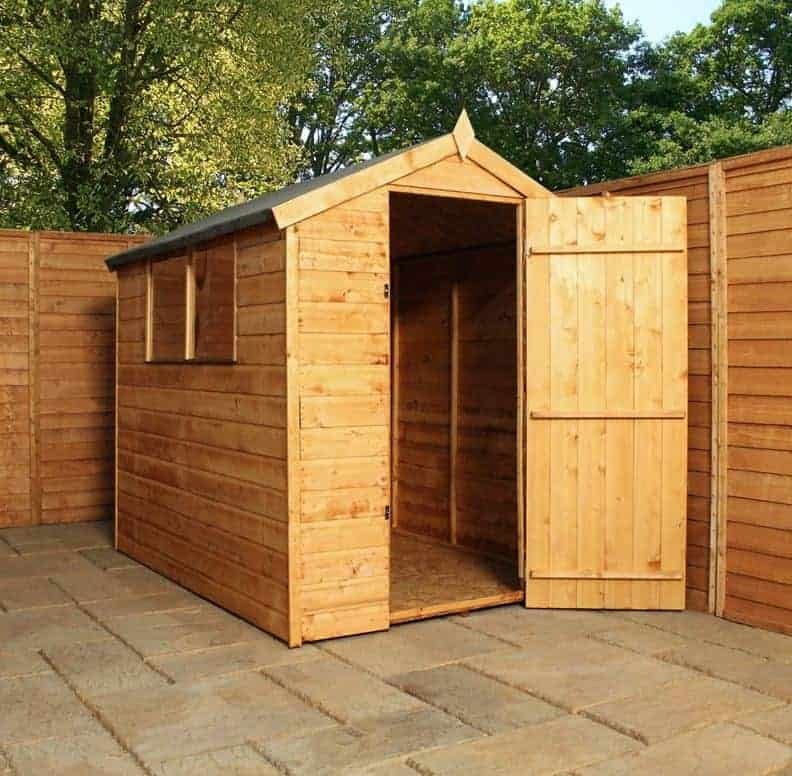 As the timber has all been pressure treated however, it’s guaranteed to be free of rot for at least 15 years which we think adds even greater value to this range of garden sheds. If you’re looking for a shed with an accommodating internal area that won’t stretch your budget, then this is certainly worth adding to the shortlist. 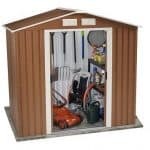 This is the second of the plastic garden sheds to make our top twenty list, and once again this has the advantage of being maintenance free other than a hose down occasionally to clean it. 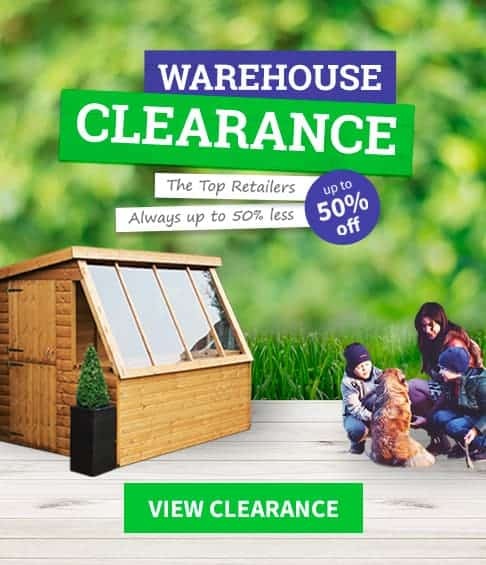 That makes it perfect for people who want a very useful garden work or storage space, but don’t want to spend time or money on it once it has been installed. Once again this has a unique look that people will either love or hate, thanks to its beige and brown design and two rows of tiny glazed windows across the upper portion of the double doors. On a sunny day these allow more light in than you might expect, which means that finding and retrieving items is easy. Built from a tough resin, there’s no need to worry about the colours fading over time, unlike some of the older plastic garden sheds that we see. For this reason we would have liked to see a much longer warranty period than the 10 year one provided by Suncast, but we wouldn’t be surprised to see it exceeding this period. This is, however, one of the smaller sheds in our league table, and its higher price compared to the Keter model accounts for their relative placings. This is the first of our top twenty garden sheds available online in the UK to feature a pent rather than apex roof. This gives it a very different look, of course, but it’s still one that we found aesthetically pleasing, and one that we feel will appeal to traditionalists. Whilst the pent roof has enough of a pitch to ensure that rain, and even snow, quickly slides away it also creates a less obtrusive look. 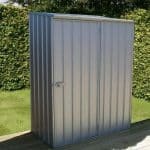 It also means that the shed is easier to hide behind a fence or wall, which is why we feel that it could be used as a security shed, especially as a key operated rim lock is included as standard. It was also good to see that the window, which can be positioned on the right or the left, had toughened glass in it which is another security boosting feature. Some garden sheds with pent roofs can seem a little restrictive once inside, but we were pleased to find that this wasn’t the case here, thanks to a taller than average eaves height of 1.85m or just over six foot. We were equally pleased to find that the timbers had been pressure treated by the manufacturer, and that once again this meant that a 15 year warranty had been supplied by Shed-Plus. We always prize value greatly when it comes to all kinds of garden buildings, but it also has to be allied to high quality components and design. Both of these things come together in yet another Shed-Plus building, which is why it earns a place within our top 20 league table. It’s certainly not the largest of the sheds on this list, with a base area of 1.80 x 1.16m underneath an apex roof that rises up to a peak height of 2.01m. Neither is it the most eye catching design, although we did like its rustic appeal. 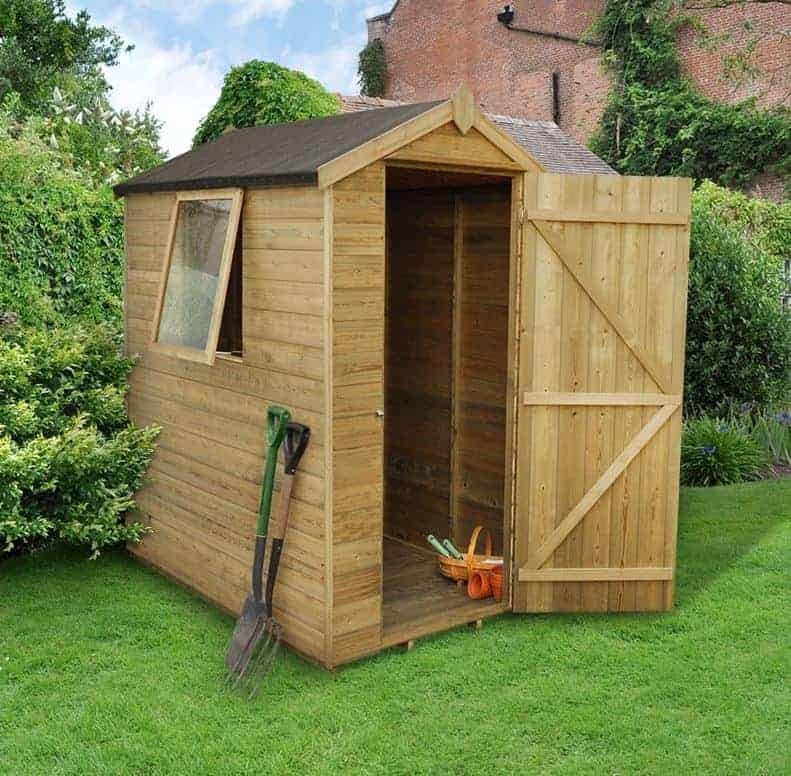 It is however the cheapest of all the sheds in our list, and as it also comes with a 15 year warranty thanks to the long lasting pressure treatment that has been applied we feel that this is probably the best value garden shed we’ve reviewed. Of course, for this price there have to be certain trade offs: for example, overlap cladding is used rather than tongue and groove cladding, and the roof and floor are made of solid sheet material. The floor is supported by integrated and pressure treated floor boards however; this isn’t something that we would necessarily expect to find in such low cost garden buildings, and it helps to protect the timber as a whole from the threat of ground moisture. As we explained earlier, all of the garden sheds to feature in this league table have to include windows as we feel that this is one of the factors that differentiate them from small security or storage sheds. The inclusion of a window, or windows, brings with it a lot benefits, creating a pleasant interior that you can spend prolonged periods of time inside. It can also, however, bring added vulnerability as passers by may be able to see what’s being store within the building and this can attract opportune thieves. This BillyOh shed comes up with a very practical solution, which is why it gains a place in the top half of our league table. Light is provided by a series of tiny windows, but because they are so compact and placed so high up on the wall they make it practically impossible for unauthorised eyes to see within. We were also impressed by the size of this shed, with a base size of 2.02 x 2.39m and an apex roof that reaches up to 1.97m. On the downside, however, the timber has been dip rather than pressure treated, and it comes without a floor which must therefore be added as an optional extra. This prevents this cleverly designed building from climbing up our list of the very best garden sheds. 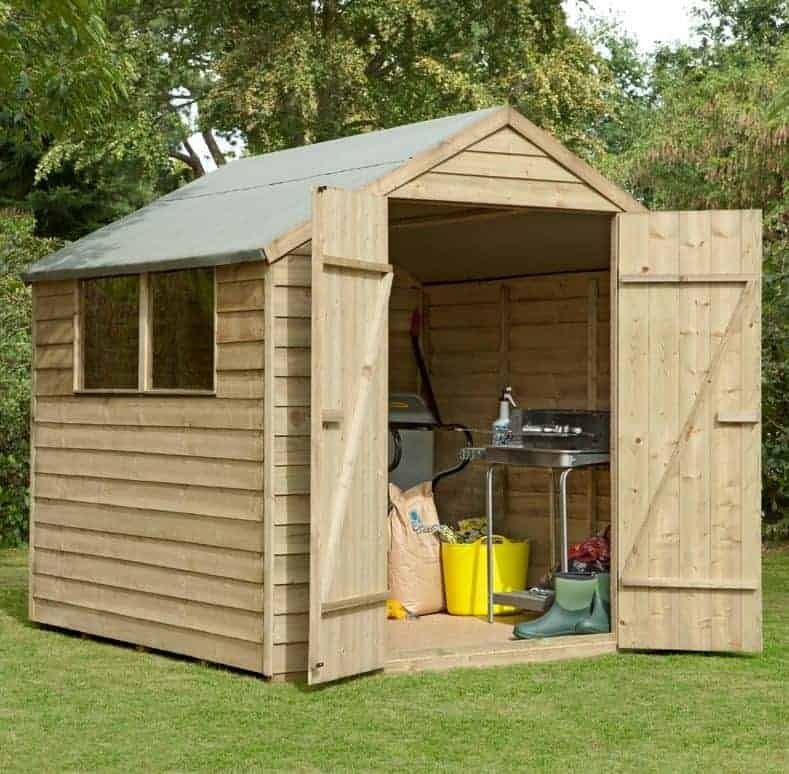 Looks wise, this adheres closely to the style of apex garden sheds that have been enhancing British gardens for many decades now. One of the things that sets it apart, however, is that it’s been made from sustainably sourced timbers that comply with the government’s ‘sustainable homes code’. While that will appeal primarily to building contractors, it’s also good news for garden owners who are concerned about the environment and who want to control their carbon footprint. Another feature that we particularly liked about this eight foot by six foot shed is that it has a bank of four windows that run down the full length of one side. 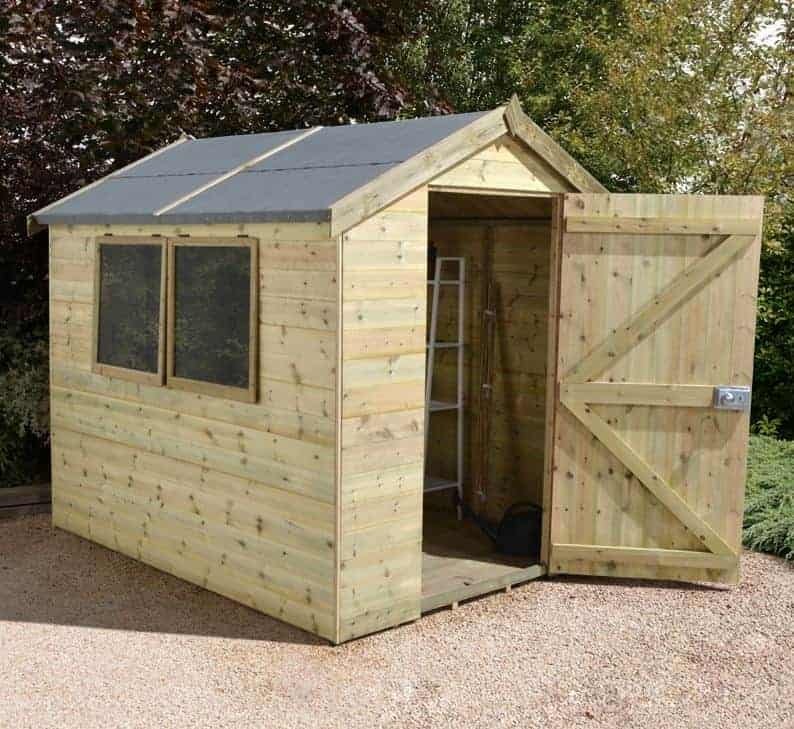 That means that this is one of the best illuminated garden sheds that we’ve seen, which makes it a great place to carry out work or a hobby activity, or to simply sit inside reading a book. We also feel that this represents good value for money, and it’s only the lack of a longer warranty period that would have come with an initial pressure treatment that stops it from being ranked in the top half of our league table. As it is, a ten year warranty is provided, although this is dependent upon the customer adding regular preservative treatments themselves to keep the warranty valid. Whilst most of the garden sheds we review may lack the exciting and innovative designs that we see on some other garden buildings, it’s this traditional appeal that many people like so much. 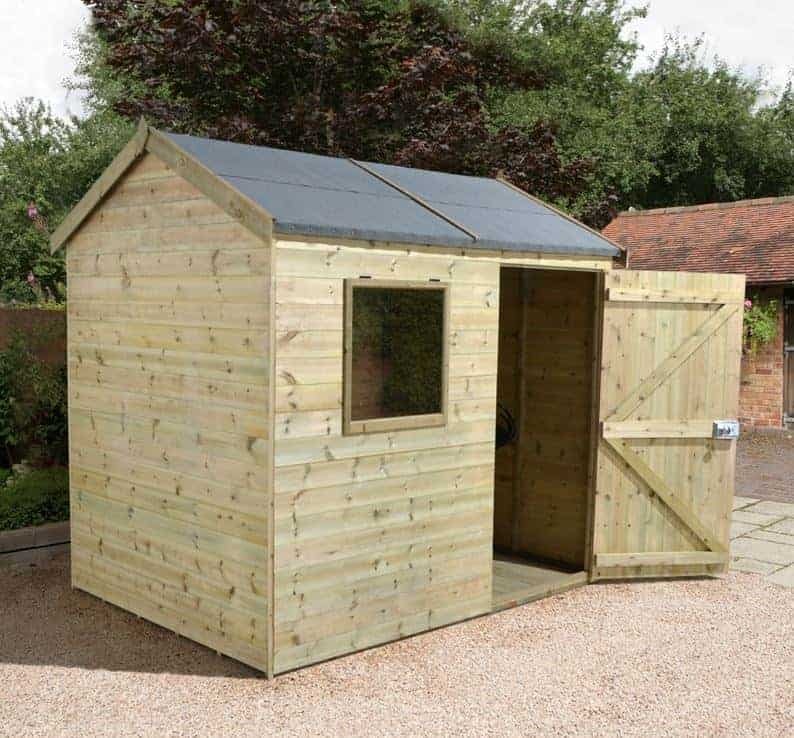 This is a very classically designed shed, with a rectangular design measuring 1.22 x 1.83m, and an apex roof with a diamond shaped finial at the front. We did however find that it caught our eye upon first sight, partly thanks to the smooth planed tongue and groove cladding for the walls. 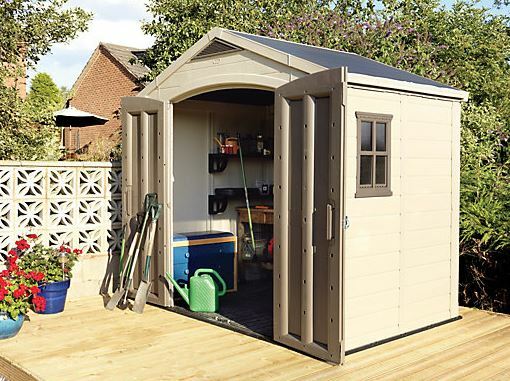 It makes this look like an expensive shed, but in fact it’s one of the most affordable garden sheds we’ve reviewed, with a price tag of not much more than two hundred and fifty pounds. Its compact footprint makes it a good choice not only for people who are looking for a reliable garden shed on a tight budget, but also those who don’t have too much garden space to spare. Despite its dimensions, there’s still enough room to move around in inside, and there’s also enough natural light to move around in thanks to the inclusion of two styrene windows. 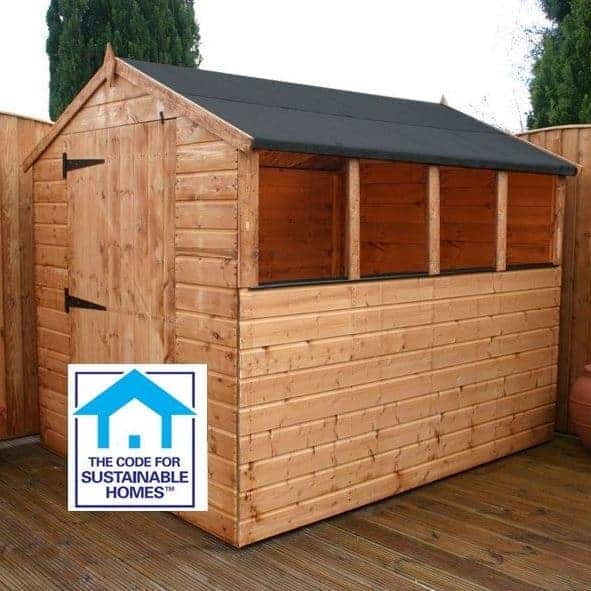 Overall value for money is further enhanced by the inclusion of a 10 year warranty, which we feel is acceptable for such affordable garden sheds. 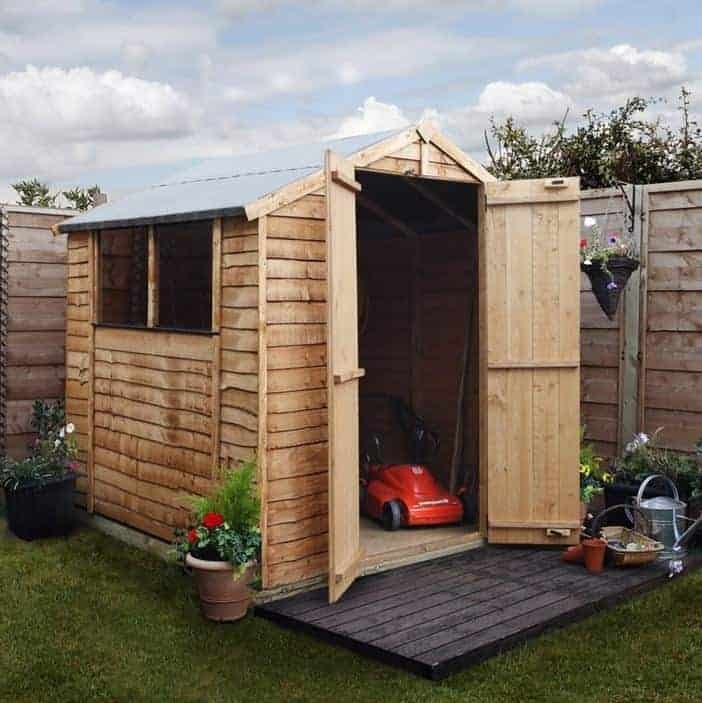 When garden space is severely limited, but you still want to enjoy the many advantages that garden sheds bring, this corner shed can be a perfect solution. Its five sided design means that it can fit snugly into a corner of just about any garden, leaving more precious lawn space free. This also makes it much less obtrusive, especially since it has a pent rather than apexed roof. For that reason we feel that this will be especially useful who want garden sheds that are functional first and foremost, although we still found it quite pleasing to look at. We were pleased to find that tongue and groove cladding had been used for the walls, even though cheaper solid sheet material had been used for the roof and the floor. We also liked the use of double doors, with a square window on either side, as this makes it much easier to manoeuvre wide or tall objects in and out. Thanks to its seven foot by seven foot base area it’s surprising just how much can fit into a small corner or the garden, although the corners do take up some of this space. It also comes with the reassurance of a 10 year guarantee against rot as long as the treatment schedule is adhered to. The BillyOh range of garden sheds are very diverse in their make up, but they all have certain elements in common. On the plus side, this means that they are very well built from high quality components, and that they always look aesthetically pleasing. On the downside they often have short warranty periods, although the 10 years provided here is as long as we find on any timber sheds from this manufacturer, and they typically come without any flooring as standard. It only costs £37 to add a solid sheet floor to this six foot by six foot model however, or £51 for a stronger tongue and groove floor, and so even allowing for this we still feel it offers good value for money. The first thing that we noticed about this building is that it’s taller than we usually see with BillyOh garden sheds. The ridge height of 2.22m makes it good for those who need a little more headroom either for themselves or for storage purposes. We also liked the bank of windows which take up the full width of one side, and we were pleased to see that guttering and a downpipe are also included as standard which is more than we’d have expected with a shed costing as little as this one. Garden sheds are among the most practical garden buildings of them all, but it’s good to see that they can still have an individual look that grabs the attention for all the right reasons. Whilst this particular shed still has the apex roof that is so effective at channeling water away and keeping the interior dry, the apex itself is offset. We found the result very striking, and this simple design feature makes the shed as a whole look unlike any of the many other garden sheds we’ve reviewed. 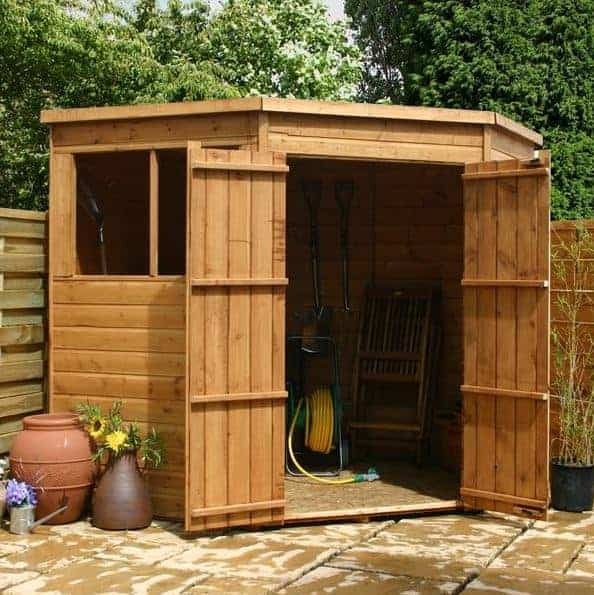 If you want a well built wooden garden shed that will look different to anything your friends or neighbours have, then this is well worth considering. It has a seven foot square base area, and the offset apex roof reaches a ridge height of 2.15m so it feels comfortable and spacious inside. There’s only one window, alongside the single door, but on a sunny day this still provides an adequate supply of natural light for most purposes. As the shiplap cladding has been dip treated it will need to be treated regularly with wood preserver by the customer, although it does then come with a 10 year guarantee. For its size however it is a little pricier than many of its competitors, although many will feel it’s worth paying extra for its unique and attractive styling. Pent sheds have loyal fans across the country, as they provide a good standard of protection against the elements without standing out too much or creating a shed that’s much taller in one area than another. For lovers of pent garden sheds, this model from Empire is definitely one for the shortlist. Its six foot by five foot base area gives it a compact footprint that makes it ideal for smaller gardens, and yet the head height of 2.00m means that you won’t have to bend down too much when walking around within it. What caught our eye most about this particular pent shed is that it has three well sized windows on the larger end panel, creating a very well lit interior to work or relax in. We were also impressed to find that the tongue and groove timber used for the walls had been pressure treated to give it long lasting protection against wet rot. We would usually expect this to bring a 15 year warranty with it, but on this occasion it only has a 10 year manufacturer’s warranty. With an above average asking price higher than we see on most six foot by five foot sheds as well, this prevents it from being placed further up our league table. 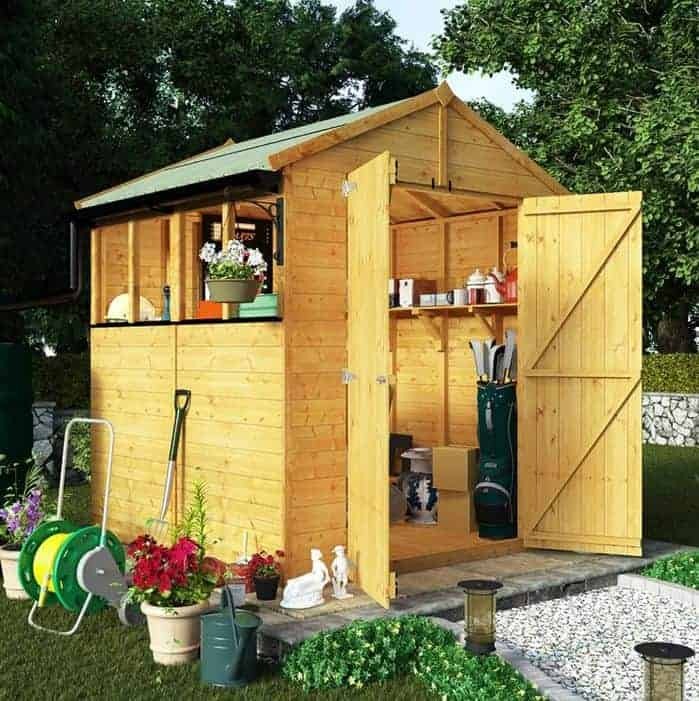 We feel that six foot by six foot garden sheds are an ideal size for most small domestic gardens, as they can hold a good amount of tools and equipment and still have enough room to move around in, and yet they won’t take up too much garden space that may be in short supply. This shed is even more useful, however, as it has an unusually accommodating ridge height of 2.34 at the top of its reverse apex roof along with a generous eaves height of 1.95m. 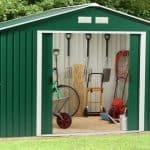 This is significantly more than we find with most garden sheds we’ve reviewed, and means that there’s lots of space for storage purposes or simply to move around in. We also liked the use of high quality redwood tongue and groove cladding throughout, especially as it’s supported by a 50 x 38mm frame. This is substantially thicker than we usually see used on wooden garden sheds of this size, and means that it feels very strong and solid once the installation is complete. 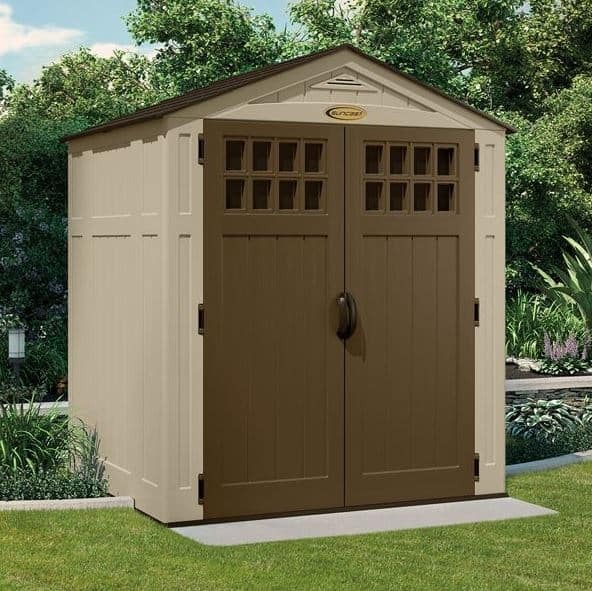 This is a garden shed with a lot to recommend it, and it would have earned a much higher position if it had come with an extended warranty and if it had been priced a little lower. If you think that all plastic garden sheds look the same, then you certainly haven’t seen this beautiful model from Grossfillex. It’s like no shed that we’ve seen from any other manufacturer, and has a contemporary designer feel about it that will fit in perfectly with houses that have lots of modern features. The first thing we noticed was the blue colour scheme, but it’s very subtle giving a pastel like appearance that contrasts with white detailing. The overhanging apex roof also caught our eye, and in conjunction with the tough PVC cladding it ensures that no water can get into the shed itself. A single door is centrally positioned at the front of this six foot by five foot shed, and once again it has a unique look all of its very own thanks to a rectangular window placed at the top of it. By careful positioning of the shed this can also make it very hard for anyone passing by to be able to see what’s kept inside, yet it still allows natural light to reach the interior. The 10 year warranty could have been longer for such a tough and well built shed, and it’s substantially more expensive then other garden sheds of a similar size, but if price isn’t a primary consideration then this should be near the top of your shortlist. This is one of the most attractive traditionally styled garden sheds that we’ve seen thanks to the high quality smooth planed timber that’s been used for the cladding and the slightly overhanging apex roof. Both of these factors also help to ensure that rain can’t penetrate into the interior, which means that it should also prove to be very durable and rot resistant. An initial dip treatment has been used by the manufacturer, and even though this isn’t as long lasting as the pressure treatment and tanalisation that we like to see we would still have expected an extended warranty of 10 years or so to be provided. 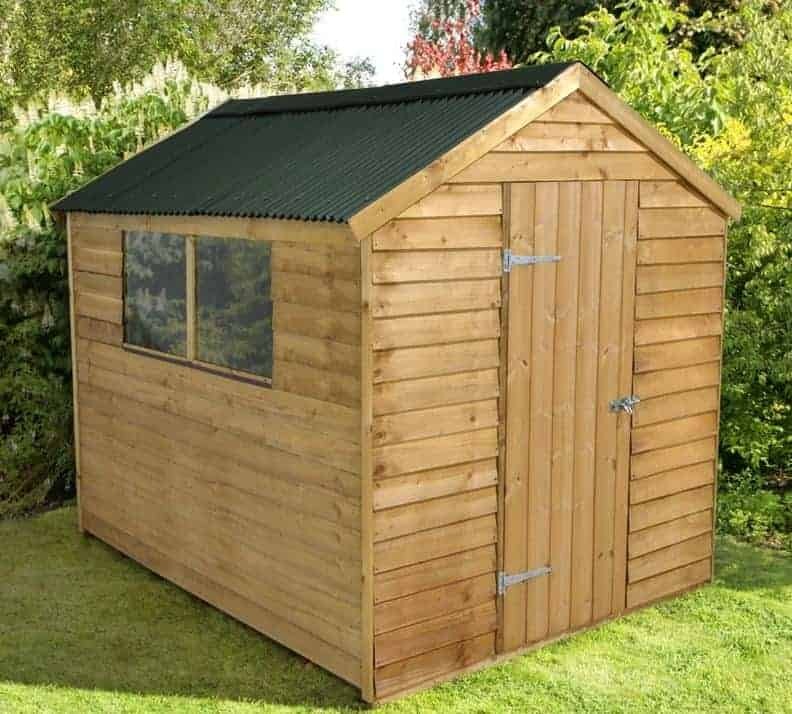 Unfortunately, however, only a 1 year warranty is supplied, which is why this otherwise very good shed finds itself in our league table’s penultimate spot. Two features that we did like were the wide opening double doors and the opening window which means that it’s easier to ventilate than many timber clad garden sheds that we review. The width of the doors make it easy to carry wide and bulky items inside, and with a seven foot by seven foot base area we can easily imagine furniture being installed to transform this into a small and affordable summer house. Unlike the other BillyOh models that have made it into our list of the 20 best garden sheds that can be purchased online in the UK today, this one has overlap cladding. This does, however, give it a rustic appearance that we found charming, and it also means that it provides exceptional value for money. 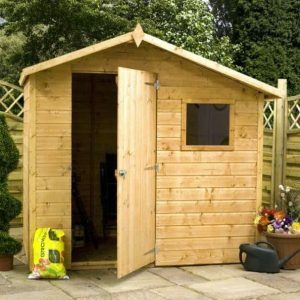 A well built six foot by six foot garden shed from a reputable company can now be had for less than two hundred pounds, making this a great choice for those looking for a new garden shed for their first home, or those looking for a low cost garden building to supplement the shed they already have. 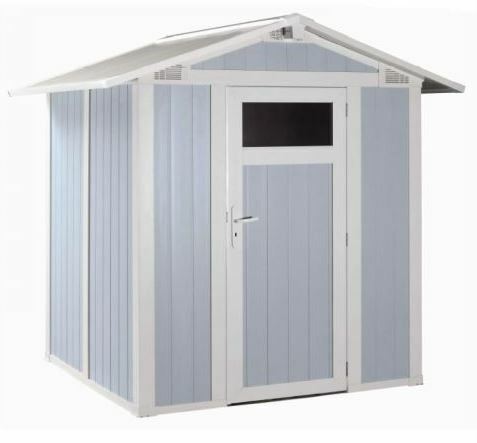 In common with the other garden sheds from this manufacturer, there is no flooring supplied. It can be installed directly onto a level area of concrete, but we feel that it would be better to pay a little extra and have one of the two optional floors added. As well as a floor we would also have liked to see an extended warranty provided, rather than the one year warranty which is the statutory minimum. Nonetheless, we feel this deserves its place in our WhatShed league table thanks to its low price point and its attractive if rustic design. Great site gave me great ideas. Thank you.